Greetings, I’m brand new to gardening, and after a lot of research, I thought square foot gardening looked like the most efficient way to do it. I decided to start gardening after my wife became pregnant this winter. All the baby books said to eat tons and tons of veggies, and so I thought this would be a cost-effective and fun way to provide them. My neighborhood community garden offered us a 4×10 plot, and I told my brother in law I would give him 1 row of 4, which leaves me with a 4×9 plot. In March I started 5 varieties of heirloom tomatos, 4 varieties of sweet pepper, and some eggplant. I have tons of seedlings, and would like to get as many of them in as possible. Here’s my naked plot. Since it’s my first time using this previously-used plot, I’m not sure what was growing here before, or what is in the soil. I supplemented it with a roughly even mix of Oma-gro (compost made from municipal clippings), vermiculite, and peat moss. I am building a 10-ft wide trellis made of electrical conduit, 5 ft high, running along the north end. (Too short? I don’t want to shade out the other community gardeners.) 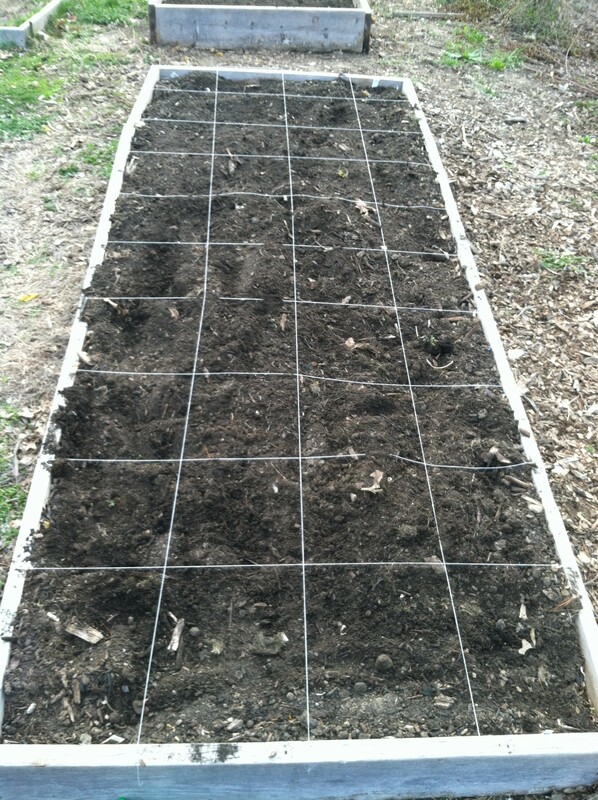 I’m playing with the idea of placing the trellis one foot into the bed (one foot south of the north end), to increase access to the tomatos, cucumbers, and melons from the north end. I’m concerned it will be harder to pick the fruit through the trellis if it’s right along the north edge. Is access an issue with nylon net trellises? I plan on pruning the tomatos to one stem each to accomodate such tight spacing. I might keep the melons to one plant (ideally two), but maybe because they’re midget melons the foliage won’t be as heavy. Anyone have experience with them? For the rest of the plot, I’m using a kind of checkerboard pattern of big and small plants to avoid planting too densely. The big ones are peppers, eggplants, and bush beans. The smaller ones are herbs, greens and carrots. The sequential plantings are staggered so that by the time I’m on my third planting, I will only be planting in the outside edge, allowing for easy access to the soil. I put marigolds and basil near the vining plants because I’ve read they help with pests. Looking forward to getting stuff in the ground real soon. It’s snowing in zone 5b right now, but frost-free date is two weeks off. Insane weather here in Omaha. I will update in the comments section as the year progresses. Please comment with any words of wisdom for a novice gardener. Thanks! Hi Caroline. Thanks for the kind words! I’m taking your advice and planting more kale. I will use the space that I had dedicated to only-marigolds. I just started my second set of sequentially planted greens, as well as some carrots. I’m wondering if they’ll germinate properly if the soil dries out during the day while I’m at work. I realize now that I probably should have germinated them in a wet paper towel before planting. Does anyone here run into problems starting seeds directly in the garden? I love your garden plan. It’s obvious that you’ve put a lot of time into studying what to do. I’ve had great success with growing tomatoes single stem and even double stem on a trellis on the north side of my beds, each in a single square. Some of the cherry varieties get very tall but I just train them to drape over the top of the trellis towards me on the north side (yellow cherry tomatoes are especially yummy!). You can always top them if they get too crazy. I’d recommend growing more kale but that’s a personal preference. 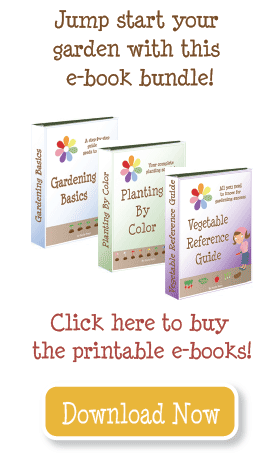 I’d never tried it before growing it myself and found that I love it – to the point that I purchased every variety available at rareseeds.com and plan to plant all of them this fall to find out which one I like the best. Plus, it scores 1000 points on the ANDI scale. Georgia collards have also produced extremely well for me in the heat/humidity we have in south Florida during the summer. They last well into June when everything else has died a painful hot/wet death. My only real suggestion is to scap the square with marigolds and just plant them individually here and there throughout the garden. It looks like that’s your plan with the nasturtium and basil. .I don’t know if the flowers actually repel pests or act as a trap plant, but they seem to help somewhat. As for bugs, for me a hose set on jet spray seems to work the best. However, I inject Bt into my squash and cucumber vines to kill the borer bugs – I have to where I live if I want a harvest and even then there’s no guarantee with any summer crop down here. Good luck, and update us on how it goes! Kathy and Emily, thanks for the notes about basil. After reading what you wrote, I think I will be putting basil everywhere, small guys wherever I can fit them. I’ll have to start more seeds. I also picked up some nasturtium seeds to spread around, as I hear they are good for pests. Since they’re vining, I think I’ll put one in each corner of the trellis, and one in the middle between the tomatos and the cucumbers. I couldn’t find any borage seeds, but I hear those are awesome companion plants as well. The one thing I’m nervous about is the tomato spacing. It’s so tight, I hope I’m not asking for disease. I’ll be really good about pruning, and see if I end up regretting it. As someone on another forum told me, everything you do in the garden is an experiment. I just had my heart set on having a rainbow of tomato plants. Kathy, thanks for the note about the weather. I’ll have to watch the soil temperature. From the charts of a nearby town, it looks like end of April had the soil temp up to 58, and now we’re back down to 42. Crazy! I like the suggestion of planting one basil plant in the middle of each of your lettuce squares. The basil will stay small while the lettuce is growing, and then when it’s too hot for the lettuce, the basil will take off. In the fall, you can plant more lettuce around the basil. Basil is also good for freezing if you end up with more than you can eat fresh — last year, I had about a dozen plants and froze several batches of pesto throughout the summer by clipping them regularly. This year’s spring weather has been so odd. I like the way you’ve identified your staggered planting dates, but be sure to keep an eye on the extended forecast before planting out the warm season plants. You want your lows to be in the mid-50’s and the soil to have warmed up, no matter what the calendar says. Plantings are getting pushed back a week or two here in the Great Lakes area, but I’m guessing that might be even longer for the Great Plains region with the ridiculously late snows you’ve been having. *Trellis–I find I prefer to have access from both sides of the trellis, so I would vote to put a trellis on the east and/or west ends. But doing it on the north will be fine. Be sure to manage and prune the tomatoes religiously! *Plant your basil with the lettuce–one in the middle of 4 leaf lettuce plants. It wards off aphids, and saves space. Just keep the basil pinched down and smaller than you would if you planted one in a square by itself. *If you can afford the space, I would give the tomatoes 4 squares each and put large cages around them. This is the least amount of work to grow tomatoes. *The rest looks great! Good luck and let us know how it went!